Inside page with names, Requiem mass, Wilfred Owen poem. 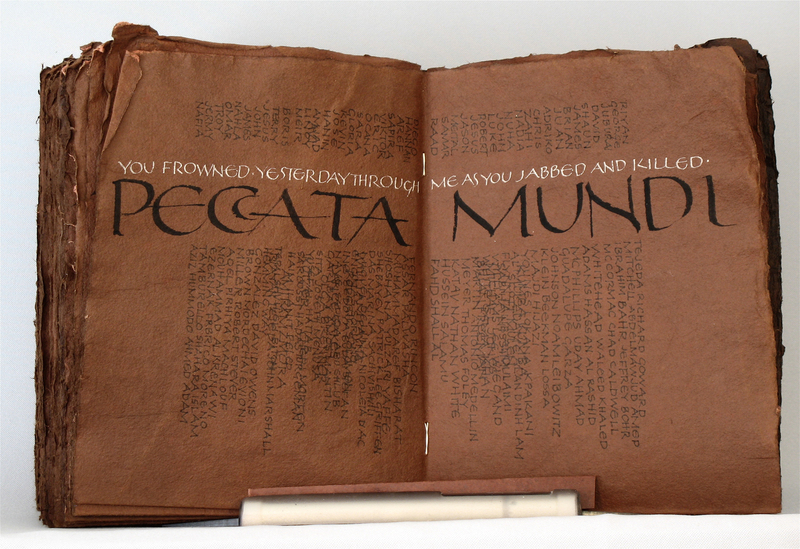 Inside page with names, Mass and poems. Inside page of names and Mass. 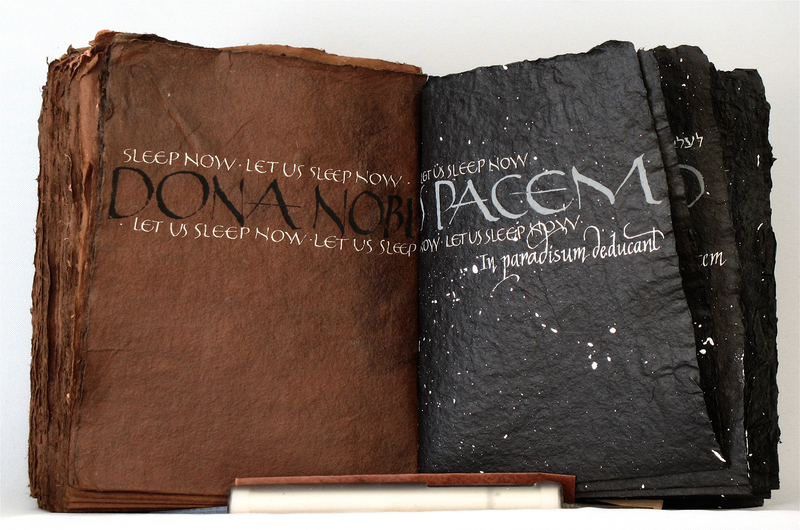 Inside page of brown and black paper with Mass, Wilfred Owen poem. 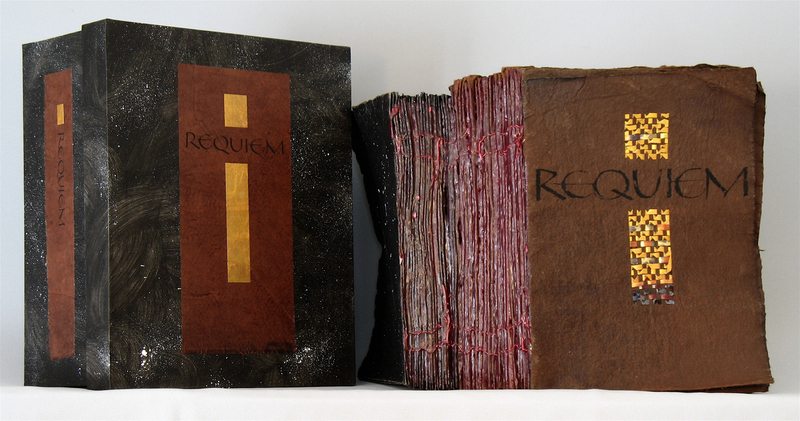 Handmade Cave Paper folded and sewn, with padding compound by Amanda Degener. 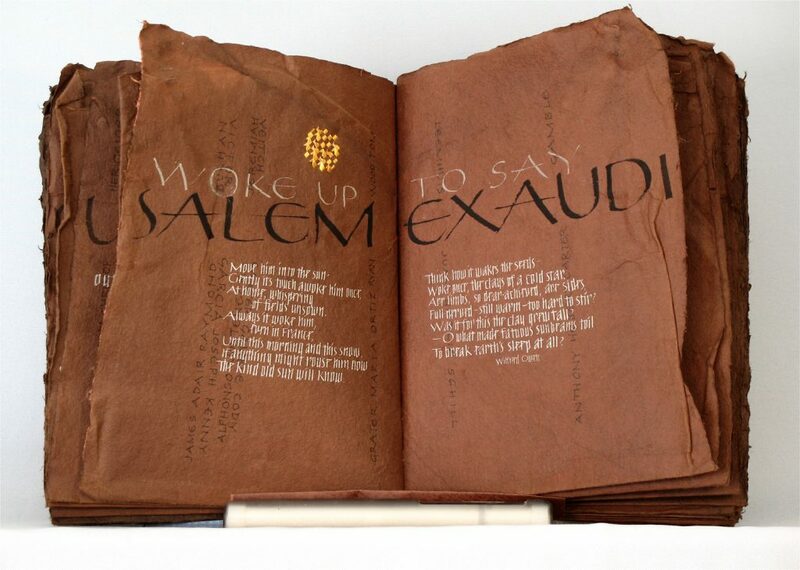 Hand lettered with gouache, sumi and walnut ink, pen; with painted woven Tyvek by Jan Owen. 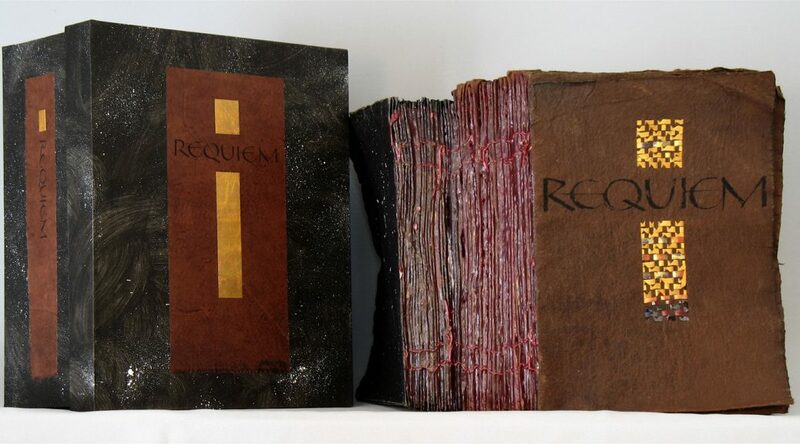 Requiem began as a gift. Several years ago I met papermaker Amanda Degener, and she gave me a large book made of her Cave Papers saying, “Do something with it.” She had folded and bound the brown and black papers and slathered red padding compound on the back. It was heavy, tactile, rough and beautiful in itself and it took time to know what to do. It had heft and needed big words. I had never thought of using war as a subject until the Bangor Symphony where I played string bass, performed Benjamin Britten’s “War Requiem.” The piece is war transformed by art – words that combine the tradition of the requiem mass with the poetry of Wilfred Owen. It is harsh music combined with exquisite beauty – the best and the worst that we can be. In the final Libera Me, the tenor and bass sing Wilfred Owen’s poem, “Strange Friend;” about two soldiers who have killed each other and ends with their voices intertwining, “Let us sleep now, let us sleep now.” Then the chorus and soprano soar, “Into paradise may the angels lead thee,” as we honor and remember those we have asked to fight. It is visually and musically heart breaking. Writing the book was a challenge; the rough pages and folds excluded guidelines and each sheet had different texture and absorbency. It was like working with something, not on it. 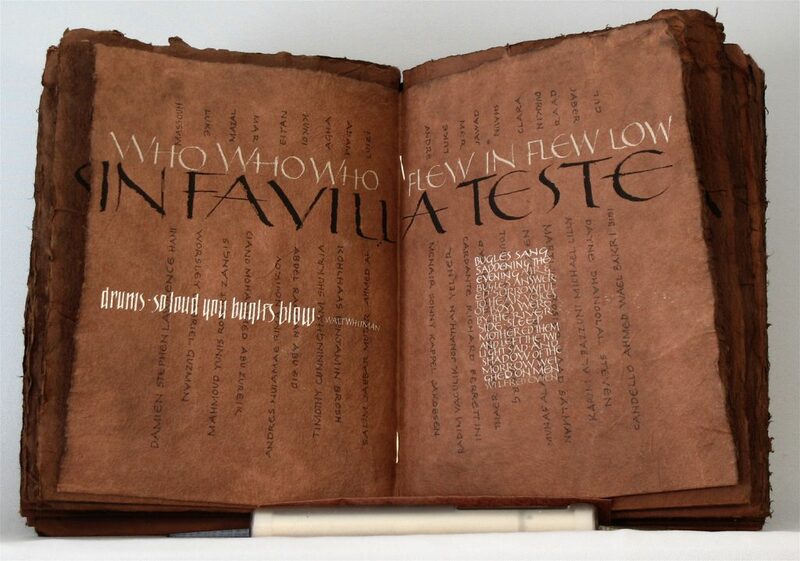 The brown pages feel earthy; the black are rough but crisp. It has felt like a collaboration of poetry, names, cautioning words we forget, earth and sky, war and beauty – paper, pen and ink.